PT Toyota Motor Manufacturing Indonesia - TMMIN is an Indonesian company that is involved in automotive industry. PT Toyota Motor Manufacturing Indonesia operates primarily as a manufacturer and exporter of Toyota vehicle and its components. The Company is recognized as the largest car manufacturers in Indonesia with installed total production capacity of 250,000 units of vechile and 195,000 enginees per year. TMMIN is a local subsidiary company of Japan-based automotive giant Toyota Motor Corporation (TMC). At present, PT Toyota Motor Manufacturing Indonesia is 95% owned by TMC and 5% by PT Astra International Tbk (Astra Group), the Country's strongest business group with strong business focus in automotive industry. Headquartered in Sunter North Jakarta, TMMIN runs its business through 5 factories, namely Plant 1 Karawang (production line up : Kijang Innova and Fortuner), Plant 2 Karawang (production line up : Etios Valco, Yaris, and Vios), New Engine Plant Kawarang (production line up : standard passenger car engines), Plant 1 Sunter Jakarta (engine assy), and Plant 2 Sunter Jakarta (packing center). 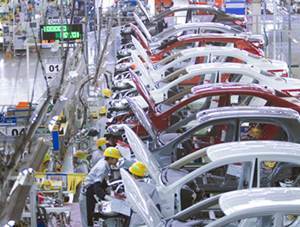 In term of operational performance, PT Toyota Motor Manufacturing Indonesia produced satisfactory results in the first quarter of 2015 (1Q 2015, ended in 31 March 2015). According to TMMIN's Press Release (28 April 2015) as quoted by JobsCDC.com, TMMIN was able to expand total Toyota Brand Completely Built Up (CBU) shipped by 30.2% from from 33,800 units CBU vehicles in 1Q 2014 to 44,000 units in 1Q 2015. Meanwhile, total Completely Knock Down (CKD) vehicle export in the first quarter of 2015 reached 9,740 units. TOYOTA SUMMIT is a 3 to 5 months of internship program at TMMIN. The program aims to facilitate students with the opportunity to experience the business process in TMMIN. Academy or University (D3/S1) undergraduate students (6th - 8th semester). Passionate to pursue career in Manufacturing industry upon graduation. Strive excellentce and eager to learn. High initiative, strong sense of analytical thinking and good team work. Willing to have full-time internship for 3 to 5 months. JobsCDC.com now available on android device. Download now on Google Play here. Please be aware of recruitment fraud. The entire stage of this selection process is free of charge. PT Toyota Motor Manufacturing Indonesia - Summer Undergraduate Trainee Program TMMIN April 2016 will never ask for fees or upfront payments for any purposes during the recruitment process such as transportation and accommodation.